America's military personnel risk their lives each and every day to secure our safety and defend our freedom. Fearlessly engaging the enemy in Operations Enduring Freedom and Iraqi Freedom, America's soldiers, sailors, and airmen executed their duties with unmatched skill and uncommon courage, enabling America to fulfill its promise to combat terrorism throughout the world. Answering the call to arms at a moment's notice, these men and women have greatly enhanced America's national security in the wake of the disastrous terrorist attacks that occurred on September 11, 2001. Fighting to protect and preserve the freedom of all Americans, their service and sacrifice continues to keep us safe. This coin is dedicated to the courageous members of the U.S. Military, whose tireless commitment to victory bolsters America's defense. 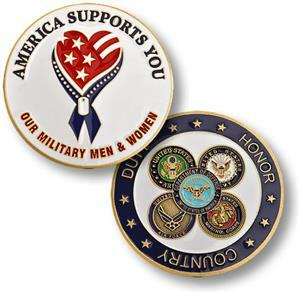 The obverse features the official Department of Defense "America Supports You" emblem. The reverse contains the official seals of the five braches of America's Armed Forces. Minted in a brass alloy, this coin contains rich enamel accents on both sides.